The actor Geoffrey Bayldon, who starred in the much-loved 1970s television series Catweazle, was partly brought to his most famous role by the chastening experience of rejecting the chance to be the first Doctor Who. Bayldon, who has died aged 93, was approached to play the Doctor in 1963. But the Time Lord was scripted as an eccentric old man, and Bayldon, then in his late 30s, was wary of being typecast in such roles, even though he was exceptionally good at them. With no inkling of the success Doctor Who would turn out to be, and put off by the punishing filming schedule, he turned the offer down after only 10 minutes' consideration. He later admitted to regretting the decision, and when another high-profile TV role - to play the even older and markedly more eccentric Catweazle - came his way in 1969, he had no second thoughts. The character of Catweazle - a wild-eyed 11th-century magician transported into the modern world - suited Bayldon to a T, and in fact the creator of the series, Richard Carpenter, had written the script with him in mind. Bayldon took on the part enthusiastically, creating one of the most instantly recognisable and enchanting TV characters of the era. In a Sunday afternoon slot on ITV, Catweazle's 26 episodes drew audiences of many millions as they charted the light-hearted adventures of the ragged-cloaked, pointy-bearded hero and his "familiar', the toad Touchwood. Inadvertently thrown through time by his own inept sorcery into the bewildering landscape of 20th-century England - where he saw magic in everything, including the "electrickery" of lightbulbs and the amazing "tellingbone" that allowed people to communicate with each other - Catweazle muddled his way through misunderstandings and escapades as he attempted to find the magic spell that would return him to his own era. The programme ran from February 1970 to April 1971, and its gentle humour and Bayldon's star quality made it immensely popular with children and adults alike. It generated spin-offs such as Christmas annuals, books and a series of comic strips. The two series, preserved on DVD, still have a cult following and even today there is a large and active Catweazle fanclub. Catweazle became Bayldon's lead into dozens of other TV roles, including the equally crusty Crowman in the late 70s Worzel Gummidge series, alongside Jon Pertwee and Una Stubbs. But he had originally set out as a theatre actor and initially paid little attention to the small screen. Bayldon was born in Leeds, his father a tailor and his mother a headteacher. Although neither parent had any noticeable acting talent, Bayldon inherited his mother's flair for narration, and traced his love of the stage to a debut at the age of four in a school play, in which he portrayed a robin. After spending three quiet second world war years stationed at Yorkshire airfields with the RAF, during which time he appeared in many revues, he began training as a professional actor in 1947 at the Old Vic theatre school in London. There he was divested of his regional accent and landed his first significant role, playing Lord Ogilvy in The Clandestine Marriage, staged by the impresario CB Cochran - who also used him, as a Romanian prime minister, in his last production, the 1949 musical Tough at the Top. Both roles were, as Bayldon put it, "the beginning of the old man route", for they made him many years older than he really was. Although he had reservations about this turn of events, he later conceded: "I was good at old men and very useful in an acting company as a result!' His fine voice, even at a young age, had a slight crack in it, which helped him portray characters beyond his years. His triumph as Catweazle sealed his TV reputation, drawing him into countless series and dramas including All Creatures Great and Small, The Tomorrow People, Tales of the Unexpected, Blott on the Landscape and Rumpole of the Bailey. In three 1979 episodes of Doctor Who he was Organon the astrologer - during the Tom Baker era and even played an alternative version of the Time Lord in two audio versions of Doctor Who stories released in 2003 and 2005. His TV acting continued well into his 80s, when he noted that he was still well qualified to play old men, and he had credits in Midsomer Murders, Heartbeat, Casualty, New Tricks and My Family in more recent years. He would attend the annual gathering of the Catweazle fanclub with enthusiasm, and in 2005 revealed that he had finally been able to watch the show with a sense of detachment. "I turned it on and I was sitting back watching myself without being conscious at all that it was me," he said. "And I was jaw-dropped. I suddenly thought: 'This fella's bloody good!" APA 6th ed. : Mason, Peter (2017-05-12). Geoffrey Bayldon. The Guardian p. 39. MLA 7th ed. : Mason, Peter. "Geoffrey Bayldon." The Guardian [add city] 2017-05-12, 39. Print. Turabian: Mason, Peter. 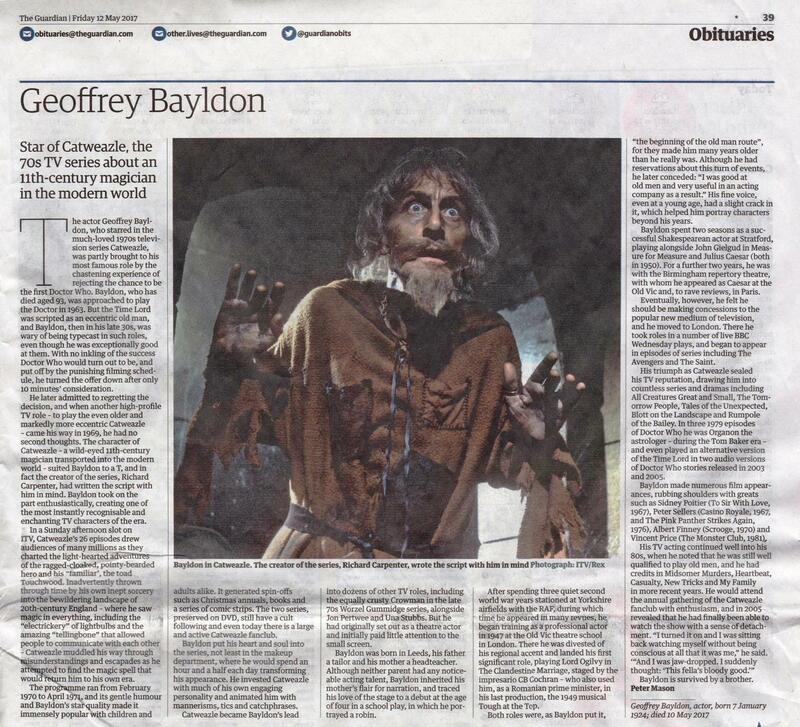 "Geoffrey Bayldon." The Guardian, 2017-05-12, section, 39 edition. This page was last modified on 28 December 2018, at 23:52.